The Jebudo ArtPark is a public art and viewing pavilion that is an effort to kick-start the revitalization of Jebudo, South Korea, by the local community. The Jebudo ArtPark is located in an unused lot in Jebudo, an island fading from the interest of tourists. 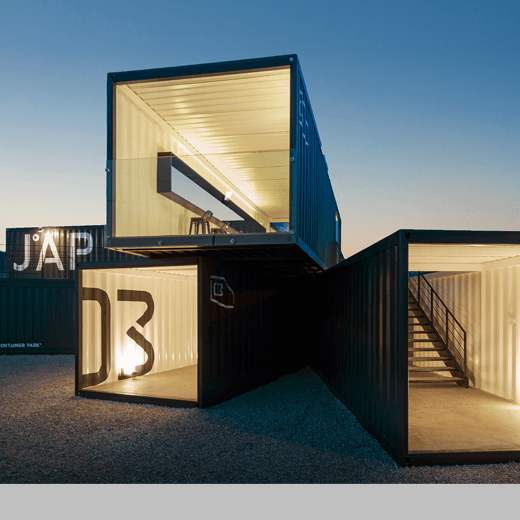 Six renovated shipping containers are carefully arranged toward the sea in order to create the best viewpoints of Jebudo’s seascape while retaining the spaces between containers for outside events and community gatherings. By exploring the ArtPark’s open structure you will discover the arts inside and breathtaking panoramic views of the landscape outside, blurring the boundaries between the arts and nature.